Anthony Weiner disgraced himself, his family and his constituents by his bizarre misbehavior on Twitter, but he has an explanation: He has some sort of psychological problem. The cable channels and other news organizations that whipped his indiscretions out of all reasonable proportion have no such excuse. They were being cheap, cynical and opportunistic. And they ought to be ashamed of themselves, though I know they won’t. To be sure, the Weiner story was a proper matter of public interest and the republic is better served with him in sext rehab, whatever that is, than flexing his pecs for his BlackBerry at the congressional gym. 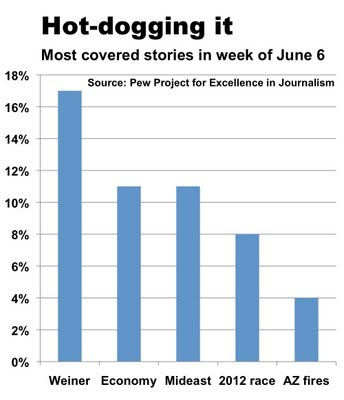 But a sad aspect of this tawdry tale is that the media allocated a stunning 17% of the available newshole in the week of June 6-10 to roasting this emotionally arrested loser, according to the national coverage index published by the Pew Research Center’s Project for Excellence in Journalism. The worst offenders in this journalistic travesty, of course, were the brain-dead cable news networks, where fully a third of the airtime was devoted to flogging a matter of no major import and no enduring consequence. The story made for great cable fare, because it represented a simple narrative about a titillating subject that was easy to get people to fulminate about. Does their cynicism know any bounds? By contrast, Pew said, newspapers allocated only 7% of their ink to the yarn, proving why we need healthy newspapers more than ever. It’s not as though Weiner-gate broke at a dull moment the news. 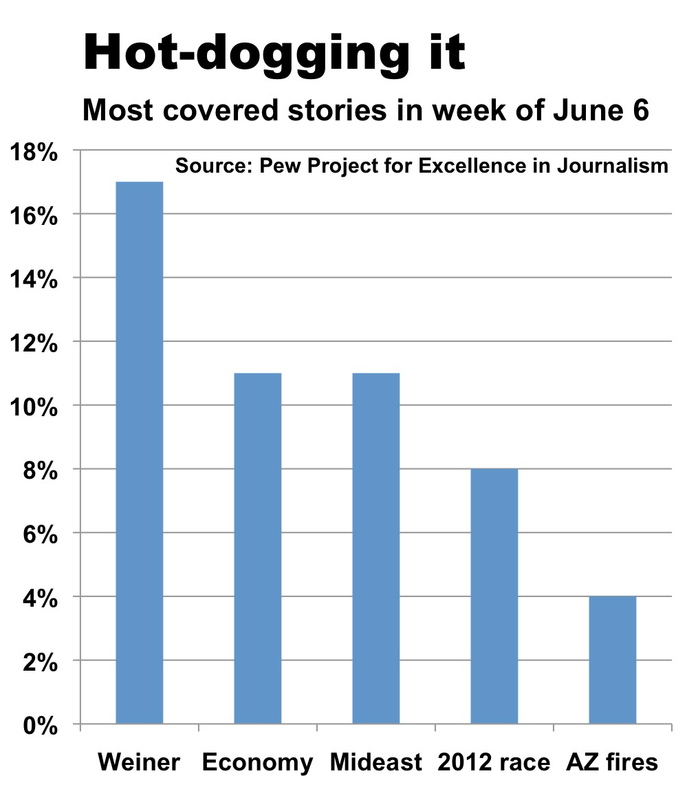 There were any number of economic stories to populate the news agenda, ranging from the battle over the national debt to the slump in the stock market to the European economic crisis. On the international front, the Mideast was roiling. Back in the U.S., much of the country was broiling. But the bullies in the media trained their big guns on a weenie. Most news organizations, including many newspapers, are desperately chasing audiences into their homes, cars, bathrooms and bedrooms on any platform they can to amass numbers. They emphasize entertainment over substance. If advancements in personal communications technology peaks and issues like improving the economy, healthcare and ending the wars we’re in go unsolved, the need for useful, objective and trustworthy news should become dominant again. We may even experience a decade or two of normalization as people migrate to outlets that have taken the risk of building journalistic integrity into their brands regardless of the platforms. Are we ready for that?